Optics is a critical enabling industry in Arizona with an estimated economic impact of $3B. Since 1992, the Arizona Optics Industry Association (AOIA) represented the Arizona optics community. 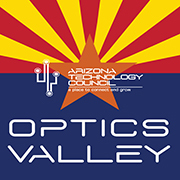 At the end of December 2016, AOIA was dissolved as an independent organization, and its work now continues as Optics Valley, a committee of the Arizona Technology Council (AZTC). The mission of Optics Valley is to catalyze, convene and connect optics, photonics, astronomy, and supporting business interests throughout Arizona. The focus of Optics Valley is to enable our members to thrive and lead in global markets by providing B2B networking, partnership and education opportunities, as well as industry support for marketing, public policy and international trade. The importance of international trade cannot be overemphasized. While our businesses are in Arizona, our trade and science partners and customers are worldwide. 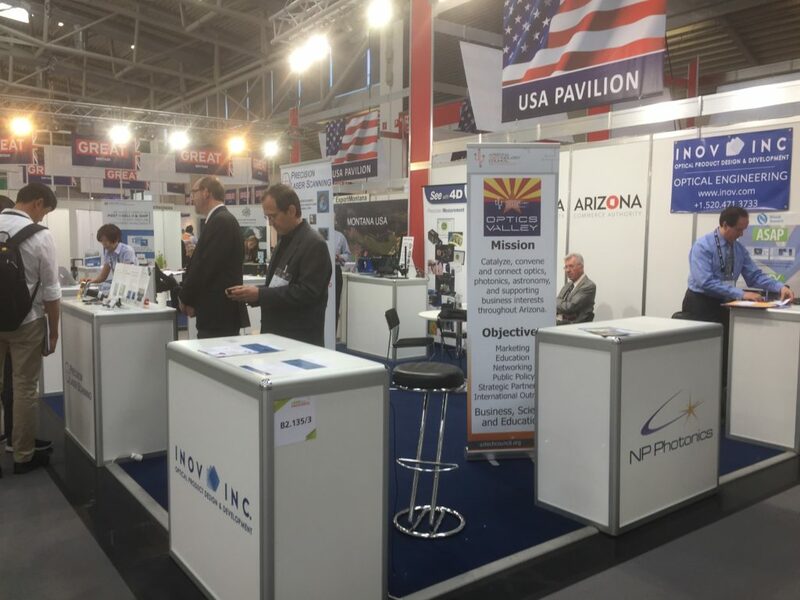 For example, last month with the support of the Arizona Commerce Authority (ACA), Optics Valley hosted seven companies in the American Pavilion at the Laser World of Photonics in Munich Germany. (see photo) Additional international activities include an Optics Valley Pavilion, including more than 15 companies, at Photonics West 2018 (PW2018) in San Francisco in January. We are also planning to host international visitors at Tucson Photonics Days immediately prior to PW2018. Optics Valley proudly maintains worldwide strategic collaborations and key partnerships, including SPIE, OSA, APOMA, AIM Photonics, NPI, OP-TEC, as well as national and interna­tional optics clusters. We work closely with the University of Arizona Tech Parks as well as collaborate with the College of Optical Sciences and Steward Observatory. With over 40 members throughout the State of Arizona and growing, Optics Valley is home to world-class institutions and businesses in science, education, engineering and manufacturing in the fields of Optics, Photonics and Astronomy. The sector is also a key supplier for many important industries, including aerospace and defense, automotive, microelectronics, medical instrumentation, nanotechnology, and advanced manufacturing. For more information, or to become engaged with Optics Valley, please contact John Dennis or Jack Schumann. The Optics Valley website is www.OpticsValleyAZ.org.